These two stocks won't pop off the page when you're screening for high-yield stocks, but they are remarkable companies that will build wealth over the long haul. Go ahead and write that quote down, because it's one of the best you'll find -- and it's accurate. Dividends give investors consistent income with the ability to reinvest and use the power of compounding. Better yet, when investors can find a stock offering a stable dividend with consistent growth, it's the best of both worlds. 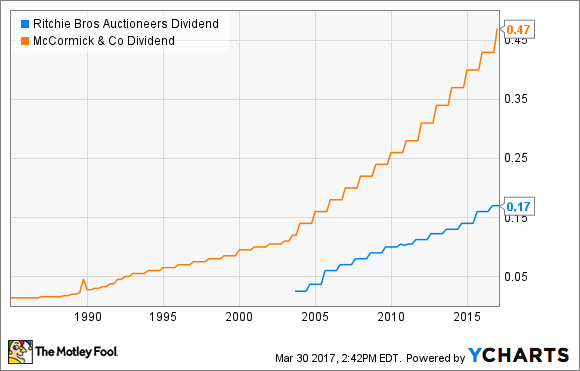 Here are two phenomenal companies that should interest dividend investors: Ritchie Bros. Auctioneers (NYSE:RBA) and McCormick & Company (NYSE:MKC). RBA Dividend data by YCharts. Ritchie Bros. Auctioneers is the largest auctioneer of heavy machinery in an extremely fractured industry where scale and network effect matters greatly. The company helps thousands of people across the globe inspect, appraise, buy, sell, ship, and finance heavy equipment online and at 45 permanent auction sites, with operations in 19 countries. The good news for potential investors is that business is booming. Ritchie Bros. held 356 auctions in 2016, generating $4.3 billion in gross auction proceeds (GAP). From that level of GAP, Ritchie Bros. made record annual revenue of $566 million and a record annual revenue rate -- calculated as revenue divided by GAP -- of 13%. That revenue rate appears poised to climb, as the fourth quarter saw a record quarterly rate of 14.11%. Despite Ritchie Bros. already dominating the industry in scale, the company continues to pick and choose valuable acquisitions, such as last year's IronPlanet purchase. It also continues to pour capital into its online and mobile presence, which further expands its reach to buyers across the globe. In fact, at a time when many companies are hit-and-miss with online strategies, Ritchie Bros. already does 47% of its total GAP online (as of the fourth quarter of 2016). The company currently pays a $0.68 annual dividend per share, a yield just higher than 2%. Better yet, management has been very clear about its priorities moving forward. They include paying down debt, repurchasing shares, making acquisitions, and -- its top priority, as you might have guessed -- growing dividends with earnings. You likely pass McCormick & Company's spices and other products whenever you shop for groceries. McCormick is a global leader in flavors and spices, with facilities in 26 countries and more than $4.3 billion in revenue last year. It's a stable and well-balanced revenue-generating machine, with 66% of sales coming from the Americas, 21% from Europe and the Middle East, and 13% from Asia-Pacific. There are multiple reasons that McCormick should make a dividend investor's short list. One is simply its size and scale advantage over its competitors. McCormick owns roughly 20% market share of the $11 billion global spices and seasoning market -- about four times the size of its closest competitor. Its sheer size and reach make it a valuable partner for large retail stores and give McCormick a slight edge with pricing power. The company is diligent about shoring up its operations to boost its bottom line. For instance, between 2013 and 2016, the company generated $339 million in cost savings and expects another $100 million savings in 2017. That's helped drive its cash flow from operations as well, which has posted a 14% compound annual growth rate for the past five-year period. And we all know what cash flow turns into: returning value to shareholders through dividends. McCormick currently dishes out an annualized dividend of $1.88 per share, which is a 9% increase over the prior year, and marks the 93rd year of consecutive dividend payments by the company. You would be hard pressed to find a more stable dividend than McCormick's. Ultimately, while these two stocks are phenomenal in my opinion, they are consistently overlooked because their yields don't pop off the page when investors scan the markets. But sometimes building wealth slowly can be the best option for income investors, and these two companies have consistently grown their businesses as well as their dividends -- and that's something no investor should overlook.